John Cabot is given credit for the discovery of Newfoundland in 1497, although many believe that the Vikings were there hundreds of years earlier. By 1583 the English had firmly established their rule over the island, and Newfoundland remained a British colony until 1949, when it entered Confederation as the tenth province of Canada. 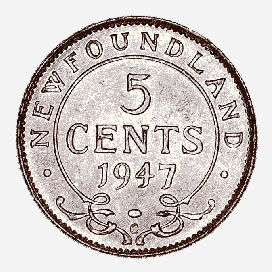 The decimal coinage of Newfoundland dates back to 1865, and the last coinage struck bears the date 1947. The 5-cent silver coin depicted was part of the last issue. The obverse bears the crowned effigy of King George VI, with his name and titles in Latin. These coins were small, about half the size of a Canadian 10-cent piece, and the people of Newfoundland commonly called them "fish scales." Newfoundland retained the 5-cent piece although Canada switched from silver to a larger coin made of pure nickel in 1922. The coin illustrated is part of the National Currency Collection, Bank of Canada.